This is what happens when you let your husband brainstorm on blog posts – you end up with a week’s worth of Super Bowl recipes and then a round-up cookup to bring them all together. And would you believe me if I told you he doesn’t even like sports? Super Bowl parties, as a general rule, are full of crap food. Fried things, melted cheese, potato chips, store-bought dips – the list goes on and on. Whether you are on a Whole30, will have just finished one up, or just choose to eat paleo-ish or gluten-free – these Super Bowl recipes are for you! And even if none of those things apply to you, this cookup provides a variety of healthy options that will wow all of your super bowl party guests and have everyone going back for seconds. It’s easy to search for Super Bowl recipes on the internet, but it’s not easy to make multiple recipes at once. 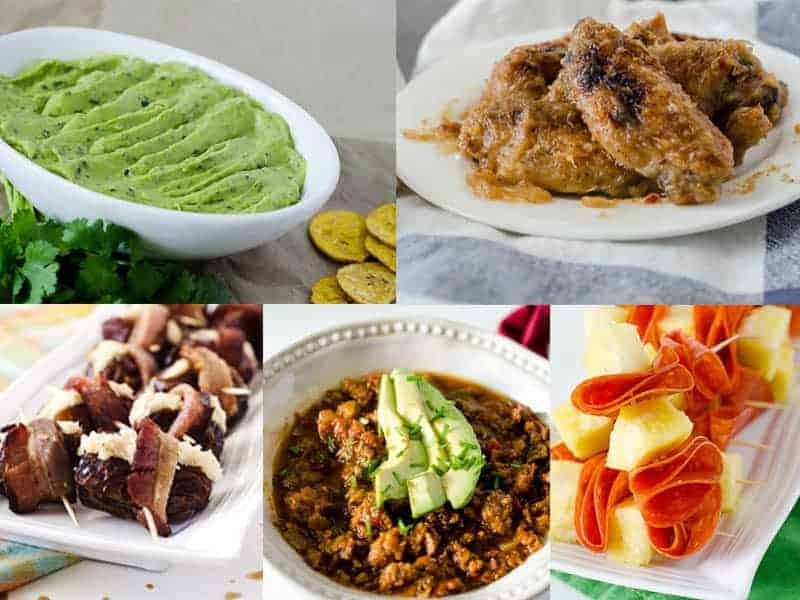 With this cookup, in under an hour and a half, you can have Turkey Pumpkin Chili, Sweet n’ Spicy Wings, Devils on Horseback, Pepperoni & Pineapple Skewers, and Cumin-Lime Avocado Dip all ready at the same time for your guests. Whether you’re having a party for two or twenty, these Super Bowl recipes just made your life that much easier! I didn’t make a recipe card for this one, because it’s really five recipes in one. 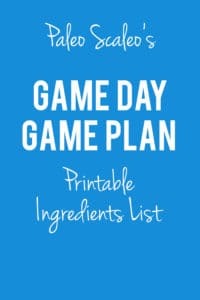 Instead, I created two printables for you – one that has all the ingredients needed for each recipe used, and one that has all the cookup steps in one list. It’s a printable version of the steps listed below, which will ensure that you are optimizing your time and all five recipes are ready at once! Here’s how it works: kickoff for the game is at 6:30pm EST. (That’s my time zone; adjust accordingly if you’re in a different one!) At 10am on Super Bowl game day, you’re going to get your slow cooker going with the chili. Then, at 5:00pm, you’re going to head back to the kitchen to do a quick cookup of everything else, having everything ready by 6:15pm and set out at kickoff time (which is your touchdown time!) Obviously if you want everything ready sooner, just head to the kitchen a bit early and get started on your cookup. These super bowl recipes require minimal cooking and are all easy and quick recipes to put together. Put on some upbeat music, get out all your ingredients, and get cooking! You’ll be done before you know it. Heat the coconut oil in a large skillet over medium-high heat. Brown the turkey in the skillet, crumbling as it cooks. While the turkey cooks, dice up the bell peppers and onion. Add the bell peppers, onions, pumpkin, tomatoes, green chilies, cumin, chili powder, garlic granules, cinnamon, smoked paprika, cayenne, salt and pepper, cooked turkey, and water to the crock pot and stir to combine. Cover and set on low for 8 hours. Preheat the oven to 400 °. While the oven is preheating, cut up your pineapple into bite-size chunks and slice open the dates lengthwise. Reserve 1 cup of the pineapple and 2 dates for the wing sauce later. Lay the strips of bacon out on a baking sheet and place in the preheated oven for 12-15 minutes. You want it cooked through, but not crispy, otherwise you won’t be able to wrap with it! While the bacon is cooking, combine the macadamia nuts, lemon juice, water, and salt in the bowl of a food processor and run until the texture resembles ricotta cheese. (You may have to scrape down the sides of the bowl a time or two.) Transfer into a bowl and set aside. Wash the food processor bowl; you’re going to need it again! When bacon is done, remove from oven and turn oven temperature up to 425°. 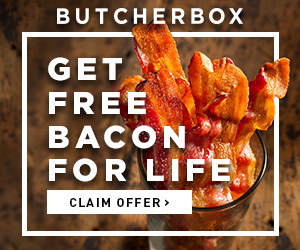 Remove the bacon from the baking sheet and set aside. Place the wings in a bowl and pour the remaining bacon grease from the baking sheet over the wings, then toss the wings to coat. Wipe the baking sheet off with a paper towel, then coat with foil. Lay the wings on a wire rack on the baking sheet in a single layer, sprinkle with salt and pepper, and bake in the preheated oven for 15 minutes, flip, then bake for 15 minutes more. While the wings are baking for the first 15 minutes, combine all sauce ingredients EXCEPT the arrowroot powder in the food processor or high speed blender until smooth. Scrape the sauce into a small saucepan over medium heat and whisk in the arrowroot powder. Turn the heat up and bring to a boil, then reduce to a simmer and simmer for 10 minutes or until the sauce thickens and coats the back of a spoon. While the wing sauce simmers, if you used your food processor to make the sauce, wash the bowl ONE more time! Remove the wing sauce from heat. While the wings are baking for the second 15 minutes, stuff each date with a bit of the macadamia nut “ricotta.” then wrap each date with a piece of bacon and hold in place with a toothpick. Alternate endings: crumble the bacon and top each date with it, or crumble the bacon and stir it into the nut mixture before stuffing. Before removing the wings from the oven, turn the broiler on for 2-3 minutes and broil the wings to crisp them up, watching to make sure they don’t burn. Add the wings to the pot of sauce and use a spoon or spatula to toss and coat. Remove the lid of the slow cooker, add the arrowroot powder, and stir. Allow the chili to sit for 5-10 minutes with the lid off to thicken before serving. While chili thickens, use your skewers to stab a piece of pineapple, then fold over a piece of pepperoni twice and stab it, alternating until all pepperoni and pineapple is skewered. On three separate platters, lay out the pepperoni and pineapple skewers, devils on horseback, and wings. Pit the avocados and scoop into the bowl of the food processor. Add the cilantro, lime juice, cumin, salt and garlic and purée until smooth. Scoop into a bowl and serve with plantain chips, raw veggies, or even pork rinds! Set out your platters, dip, and crockpot of chili and relax and enjoy the game! Need a last minute decorating idea? 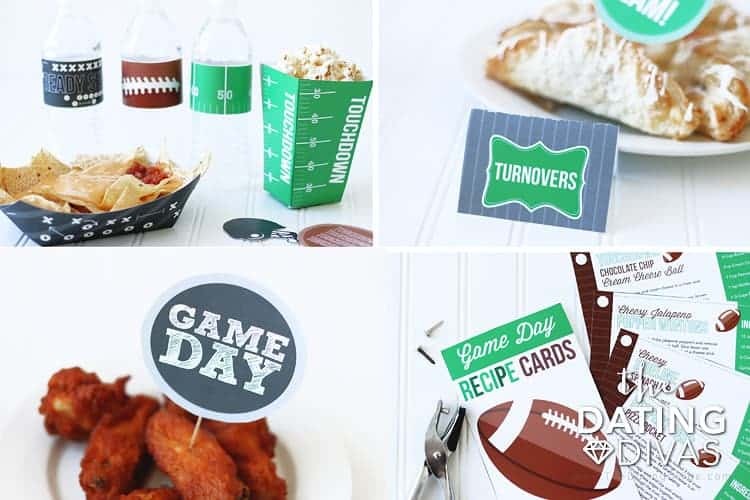 Head over to The Dating Divas and check out their Super Bowl Party Pack. It includes printables for games, decorations, food, and more!